As I was sheltering from the rain in Gorleston High Street this afternoon one of the recent arrivals in the Anglianbus fleet stopped on the opposite side of the road. 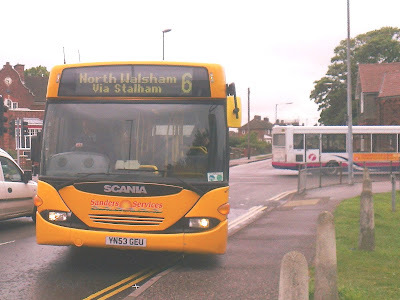 It was former Metrobus Scania OmniCity YN05HFJ, complete with Anglianbus yellow and blue livery, working the 13:38 Southwold to Great Yarmouth 601 service. This is confirmed by the cardboard signs in the front windscreen; clearly destination displays have not yet been fitted! YN05HFJ is numbered 443 in the Beccles-based fleet. It is twenty five years since the last bus was built at the Eastern Coach Works factory in Lowestoft and the museum is celebrating the anniversary of the closure of the local bus bodybuilder. In readiness for the event Neil Chilvers and Tim Major from the museum travelled to Blackpool last weekend to bring back an exhibit for the celebrations. 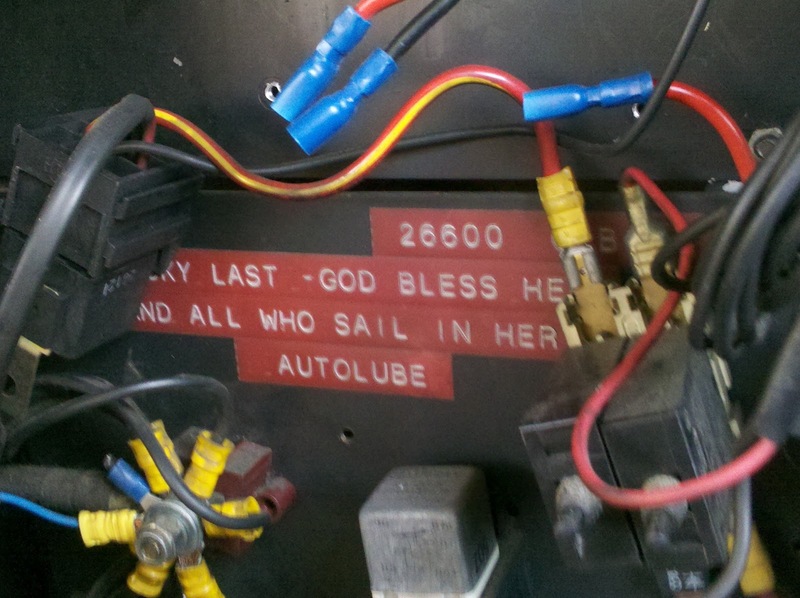 Last night Neil Chilvers opened the electrical flap of L263 and unearthed (excuse the pun!) a message inside! God Bless All.... © Neil Chilvers. 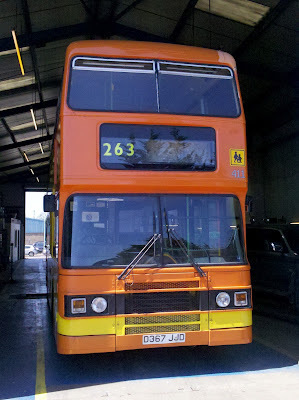 This will not be the first time that L263 has been at the East Anglia Transport Museum. She was also present at the 1988 ECW event where she was exhibited in Selkent Travel colours with cherished registration VLT 9. Richard Algar was on hand to record the event and his photograph is reproduced below. through Lowestoft on the Saturday night to the site of the former Eastern Coach Works - since long gone. 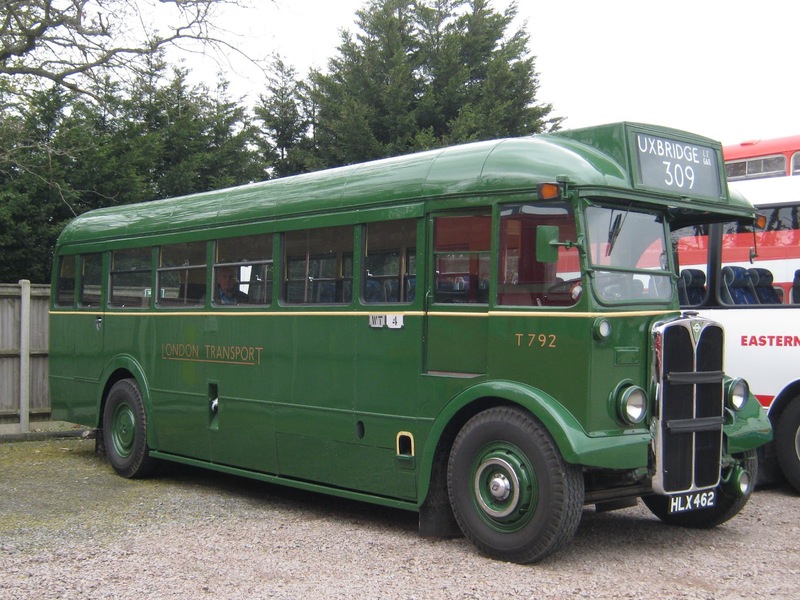 For further information about the ECW 2012 Event please visit the special events page on the East Anglia Transport Museum's website. Hopefully a report of the event will appear on this blog. Regular contributor Grahame Bessey has informed me that he saw an unusual visitor at Great Yarmouth's Beach Coach Station on Sunday. 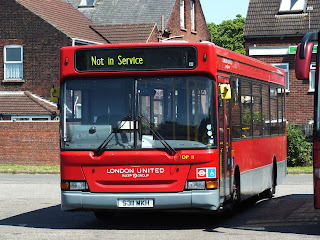 London United Dart S311MKH was the vehicle concerned and was thought to be on a day trip from the capital. This is the first time, to my knowledge, that one of their Darts has been used; although I do remember the operator using double deckers on Sunday day trips in the past. 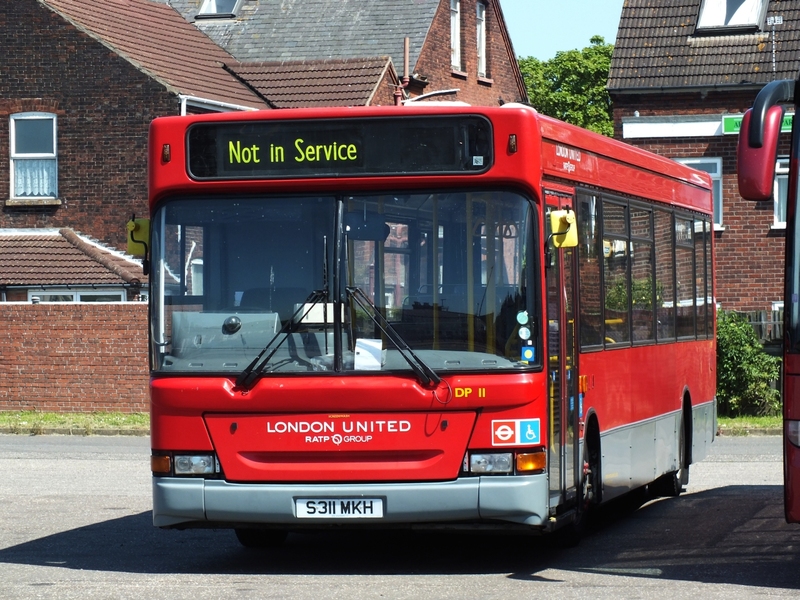 Anglianbus, now part of the Go-Ahead Group, is in the process of receiving five Scania N94UBs from Metrobus. The buses are believed to be numbers 541-545 in the Metrobus fleet with registrations YH05 HFE/F/G/H/J. Two are currently at Anglian's Ellough depot; YN05HFJ and YN05HFH. Both are in Anglian livery with fleetnumbers 443 and 442 respectively. The remainder are expected to arrive in the next week or so. In the meantime three Go_Ahead Group vehicles are on short term loan to Anglianbus. They include Konectbus Optare Excel V203ENU which is being retained as a spare vehicle. 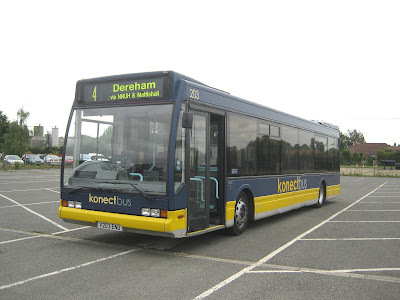 It has lost its Konectbus fleetnames and, when its loan period expires, it will be disposed of. 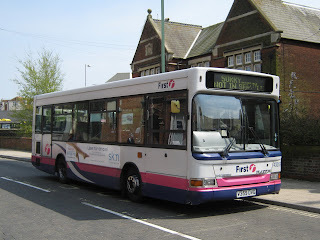 First's new X22 route between Lowestoft and Beccles via Carlton Coleville is operated exclusively by the recently transferred Mini Pointer bodied Darts from Essex. The MPDs are used instead of the SLFs as the latter are considered to be too large for the route which operates along narrow roads through Beccles housing estates prior to entering the town via the sharp turn over the Ingate railway crossing. Apart from the 18:03 X2 to Beccles, the MPDs are restricted to the X22 route and upon completion of the days workings they usually retire to the depot for the evening. However, yesterday evening an ailing SLF was replaced by 43358 (V358DVG) on town route 101 and ran until the end of service. 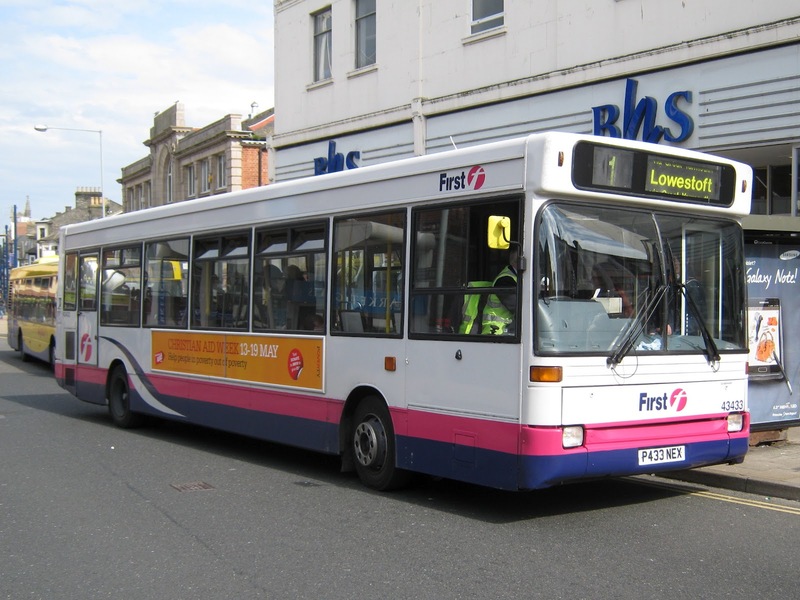 The is the first instance of the use of an MPD on a Lowestoft town service. The photo shows 43458 on its first 101 journey having relieved 43466 (R466CAH) at 19:15 in Gordon Road. My thanks to Syd Eade for the information and to James Race for the photographs. 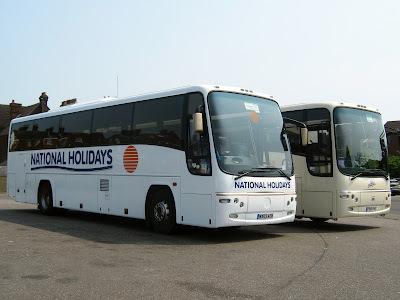 A National Holidays Volvo B12M and an Alfa Travel Volvo B12B were two of the five coaches at Beach Coach Station at 2 pm this afternoon. The former was MX03AEW, previously a Shearings liveried coach. Whilst the latter was PO59FHY which is allocated fleet number 55 by Alfa. 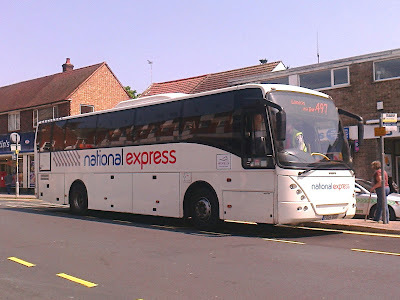 An Ambassador Travel Volvo B12M/Jonckheere Mistral was noted working the National Express 497 service to London Victoria.around lunchtime today. The 12:25 from Great Yarmouth to the capital was operated by Ambassador's180 (FD54DGU) which is seen here in Gorleston High Street stop picking up a passenger and her luggage. 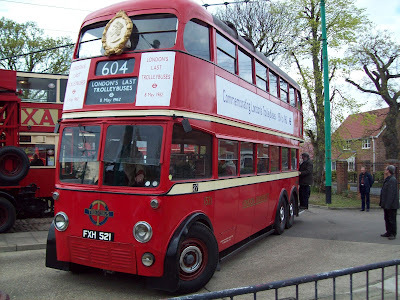 Another restored former Great Yarmouth vehicle has come to my attention through the East-Anglia-Buses-Photo Google Group. It is a former Felix Coaches Crossley SD42/7 with Yeates C35F bodywork. The collection, which represents a number of independent operators from the 1920's onwards, has been put together by the Emerton family. Mick tells me that a friend of the Emertons owns EX6644. After some research I have found that it was acquired by Dave Plant of Brerton in Cheshire as a long term project beginning in 1974! Its first outing following restoration was to the Potteries Omnibus Preservation Society's rally earlier this month. My thanks to Mick Turpin for his help with this and for his consent to use the photograph. The Traffic Commissioner for the Eastern Traffic Area published his latest Notices and Proceedings Report on 16th May 2012. The report provides details of proposed alterations to bus services in the Eastern Traffic Area. DIRECTOR(s): PHILIP JOHN OVERY , JACK HENRY OVERY , TIMOTHY PAUL OVERY . New authorisation at this operating centre will be: 17 vehicle(s). Other Details: Daily except Xmas Day. Operating between GREAT YARMOUTH and LONDON, VICTORIA given service number 497 effective from 02-Jul-2012. To amend Timetable. Operating between CROMER and LONDON VICTORIA given service number 496 effective from 02-Jul-2012. Nine coaches were observed at Great Yarmouth's Beach Coach Station early this afternoon. However, my photo of the day shows Judds Travel Dennis R/ Plaxton Paragon ECL943. Just after lunchtime time today I was able to spend an hour observing activity in Norwich city centre. My first port of call was the Bus Station off Surrey Street. At the time of my visit there wasn't much of note other than Norfolk Green's Optare Tempo 110 (YJ56ATV) laying over prior to its next duty. The photo of 607 (SN61CZX) was probably the best of the bunch and also features First Eastern Counties Trident 33242 (LT52WVL) following behind on the 27A City service. The last vehicle of interest was Emsworth & District DAF/Van Hool Y297HUA which began picking up its clients at a city service bus stop. 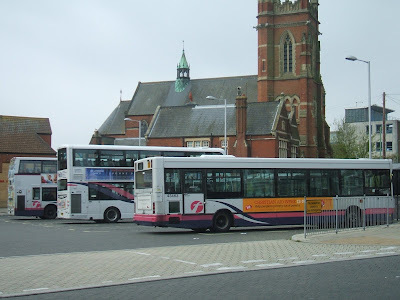 A number of other independents arrived at local stops at the same time causing service buses to double park in order to allow their passengers to embark/disembark. With local buses stopping to pick up passengers in the opposite direction, a log jam occurred with nothing moving in either direction for about two to three minutes. Clearly something needs to be done to manage this a lot better by restricting non-local coaches to pick up only in set aside areas. However, it was quite entertaining for the observer! Early this afternoon I had to make a trip to Gorleston for shopping and business reasons. Despite the showery cool weather I decided to go by foot and observed a couple of workings of note. The first was of Scania / Omnicity 307 YN53GEU travelling westbound on Church Lane with the 13:20 service 6 from the Sixth Form College bound for North Walsham..
As it was stopped by the traffic lights, I was able to get a photo of 307 making the turn onto Shrublands Way. Following my chores in the High Street I had to shelter during a shower and witnessed the arrival of First Eastern Counties Dart 42450 R450CCV on the 7 from Belton. Yesterday, the 8th May, was the actual 50th anniversary of closure of the London trolleybus system. 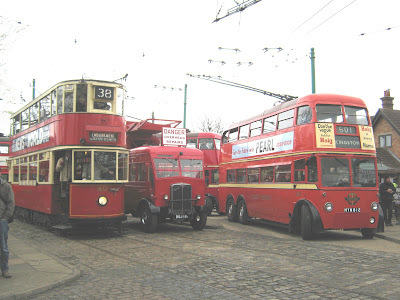 The London Trolleybus Society held a private event for various transport/ trolleybus preservation related groups. 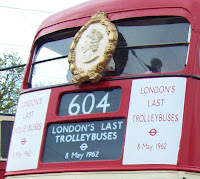 At the conclusion of the day London trolleybus 1521 (FXH521) carried decorations as it appeared in 1962. Overall the museum reports that the London 2012 Event was a great success with visitors coming from far and wide; including California and New Zealand. My thanks to regular contributor Tim Major for the report and pictures of the private event. As you will have seen from the London 2012 Event report, London Country's T class T792 (HLX162) was at Carlton Colville during two days of the bank holiday weekend. 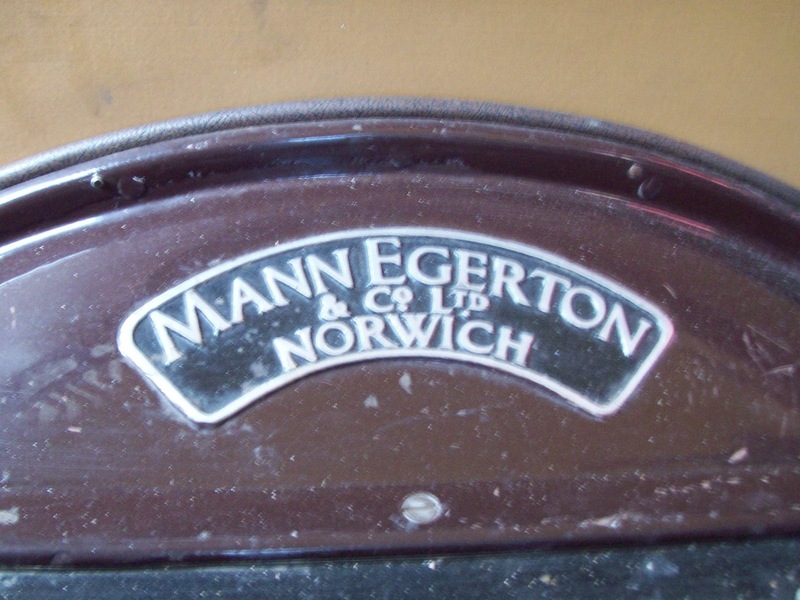 One fact that had escaped me was that the original bodywork was built by Mann Egerton & Company Limited of Norwich! 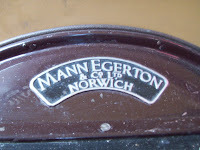 Correspondent Tim Major has reminded me of this and supports it by providing a photo of the manufacturers plate. Six coaches were present at Beach Coach Station during mid-afternoon. They surprisingly included Reynolds of Caister's Mercedes W600JSB on a Norfolk County Council schools working! 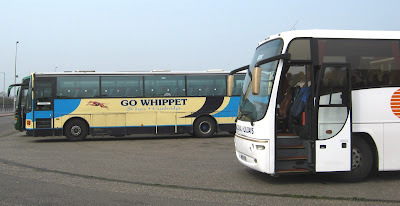 St Ives - based Whippet employed Volvo B10M J670LGA on its Coastal Service. 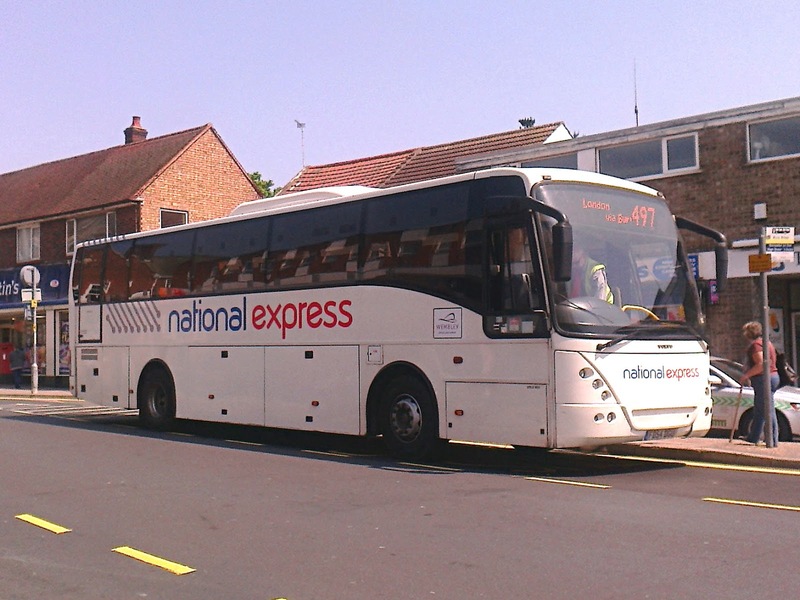 Alfa Coaches of Chorley were using Volvo B12B/Plaxton Paragon 43 (PN07LLG) on its local tours. All three recent Dart transfers from Ipswich were present at Market Gates this afternoon operating local services within minutes of each other. 43433 (P433NEX) is pictured on the 4 to Barrack Estate and was observed working on the 2 and 4 routes for most of the afternoon. 43435 (P435NEX) has already been photographed on local workings and its photo can be seen here. the former Ipswich trio can be seen about to work the 15:45 service 1 to Lowestoft outside BHS in Regent Road. 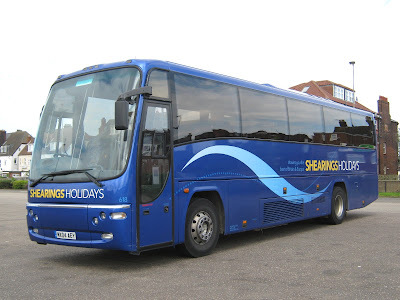 Whilst I was there Shearings Setra S416GT-HD 309 (BK11GJY) dropped off some passengers. Minutes later First Eastern Counties newly repaired and painted 37156 (AU07DXS) passed through on the X1 to Lowestoft. Whilst waiting for the EATM shuttle for the London 2012 Event, Matthew Holland photographed activity at Lowestoft Bus Station on Sunday morning. 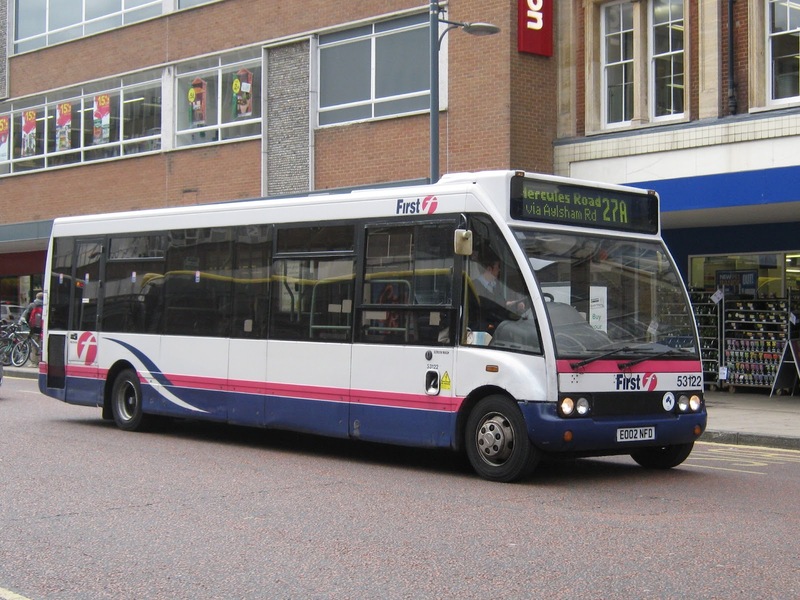 He recorded First's Volvo B7TL /Alexander ALX400 posing for the camera. 32654 (AU05MUW) is about to take up its place in one the departure bays for the 10.20 X2 to Norwich. The bays looked quite busy for an early Bank Holiday Sunday. Nearest the camera is Dart 43463 (R463CAH) awaiting its next duty. In the middle is 37573 (AU58ECX) ready for its next X1 journey. On the left is an unidentified Volvo B7TL - thought to be one of the 30886/7/9 batch currently based in the town. Following the posting on local First Eastern Counties' transfers at the beginning of May, Grahame Bessey has updated the information. 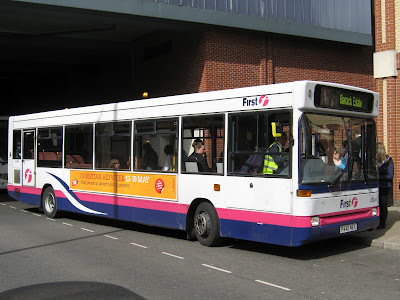 Dennis Dart 43359 (V359DVG) has moved to Lowestoft from Essex joining recently arrived sisters 43357/8 (V357/8DVG). 43360 (V360DVG) is also expected to join them at Lowestoft shortly. Lowestoft Dart 42447 (R447CCV) and Norwich's Optare Solo's 53121/2 (EO02NFC/D) are moving in the opposite direction. 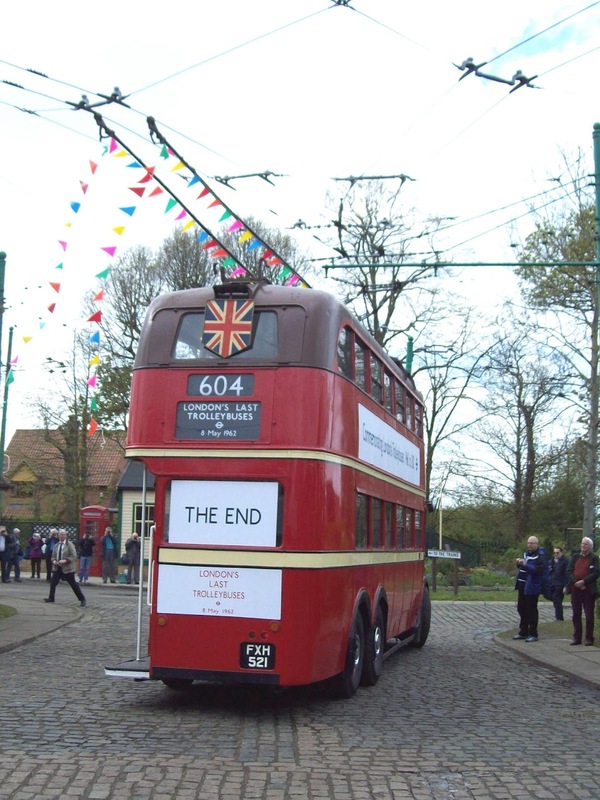 The East Anglia Transport Museum at Carlton Colville is holding this event to mark the 50 years since the trolleybus system closed in London and 60 year's since the capital's last tram. Inside the museum the star of the show was Didler No 1 (HX2756) which was offering rides around the complex. Behind is L3 class 1521 (FXH521) which was delivered to London Transport in 1940. During its working life 1521 sustained war damage; operated in the East End and was de-licensed at the end of trolleybus operations on 9th May 1962. Also on display were two K2 class trolleybuses - 1348 (EXV348) and 1201 (EXV201). The latter arrived in December 1938 and spent 20 years at Streatham Hill. Delicensed in July1961, it went to Ireland for preservation in January the following year. It subsequently moved back to the UK and is now based at Sandtoft. Q1 trolleybus 1768 (HYM768) is seen here on its circuit of the museum passing C2 class 260 (CUL260). The former arrived at London Transport's Fulwell depot in 1948 and stayed there for most of its life. 260 spent all of its operating life at Stonebridge. Its last day in service was November 1959 and the following year was acquired by a Paris transport museum. After almost 50 years in France it returned to the UK arriving at Carlton Colville on 6th October 2010. Meanwhile, on display at the tram / trolleybus terminus was a former London Transport AEC tower wagon 89Q (DGJ181). 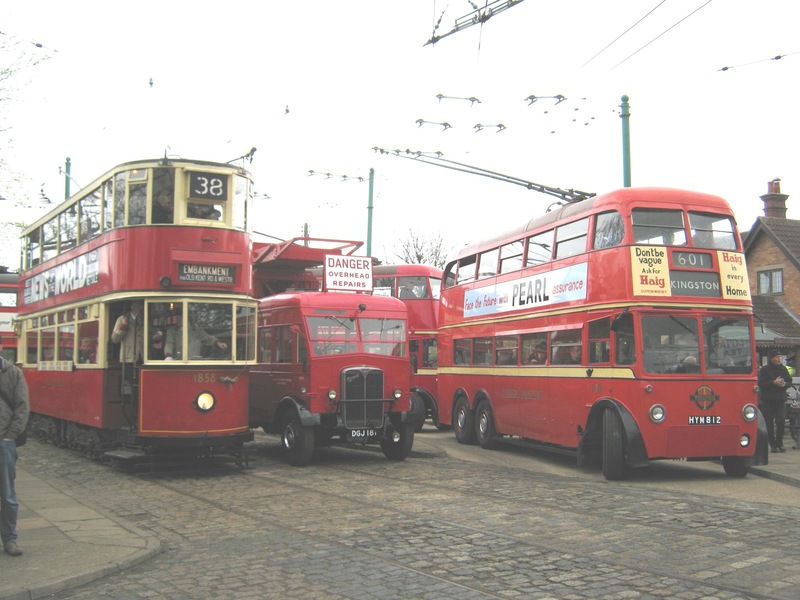 She is seen here flanked by London Transport tram no.1858 and Q1 trolleybus 1812 (HYM812). 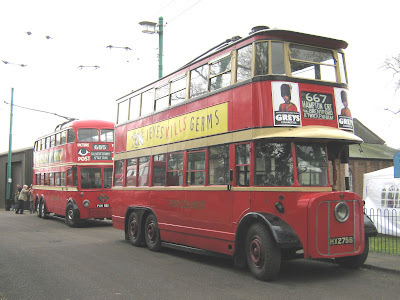 The former must be the most travelled London trolleybus having spent its working life both in London and Spain. 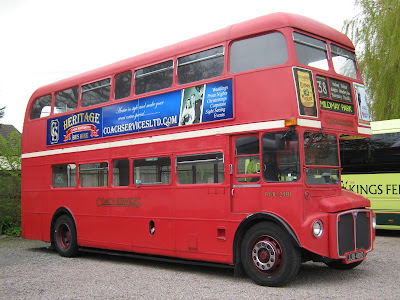 As already mentioned above, visiting buses also had a London - based theme. Among them I counted 4 RMs, 3 RMLs, 4 RTs 1 RTL and 1 T.
The T class began to appear with London Country from spring 1948 onwards. Fortunately one survives and that was T792 (HLX162). In 1960 T792 operated from East Grinstead and Tring garages before going into store in October of that year. Delivered in November 1959, it saw use in London until final withdrawal in April 1985 and was latterly allocated to Willesden Garage. Behind RM158 is RT935 (JXN325) and RM1063 (63CLT). Younger RM1063 began its life with LT in January 1962 and lasted 25 years before being sold to Wycombe Youth Council in August 1987. One of local operators participating with a London vehicle was Coaches Services of Thetford. and operated on shuttle services during the day. 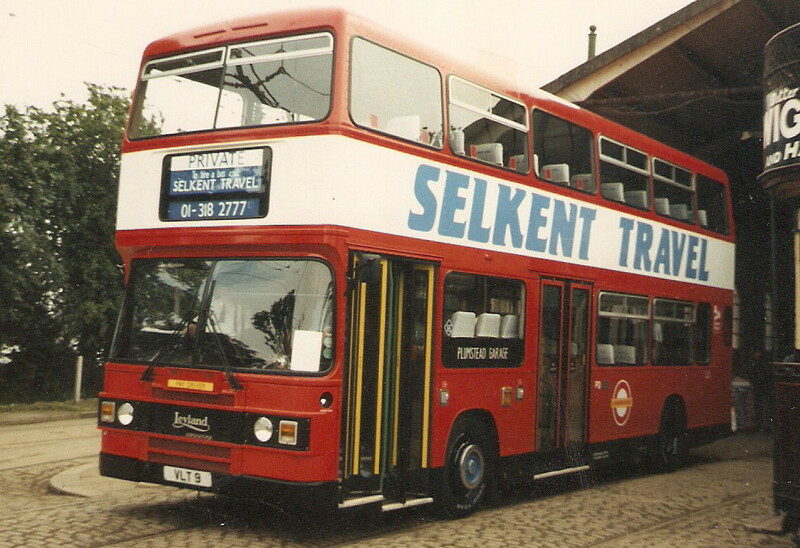 New to Aldenham depot in January 1966, it was taken into stock by Leaside Buses on privatisation and its successor, Arriva London North, withdrew her from service in October 2005. A quick glance at the notice board found it to be London Country RT3125 (KXW234). 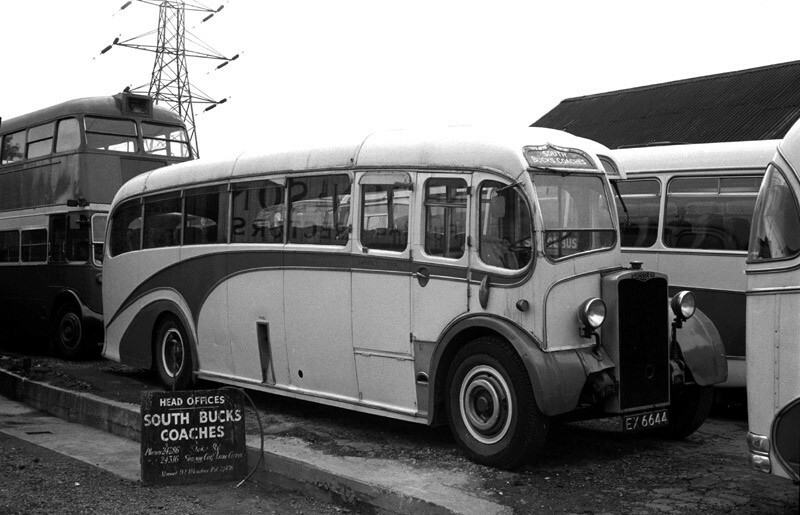 RT3125 was new into service in April 1950 at Dorking and was finally stored exactly 23 years later. Now privately preserved it is on loan to the museum. 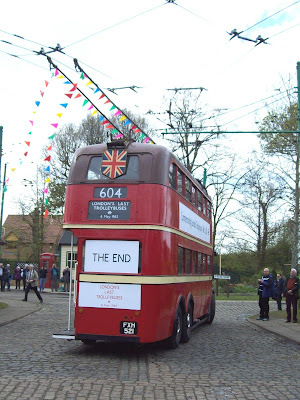 My thanks to all those at the East Anglia Transport Museum who made the event such a success. Following a posting on here on the 23rd April 2012, regarding service changes, it was noted that First Eastern Counties would be reintroducing a seasonal service in Great Yarmouth linking the holiday areas and the town centre. 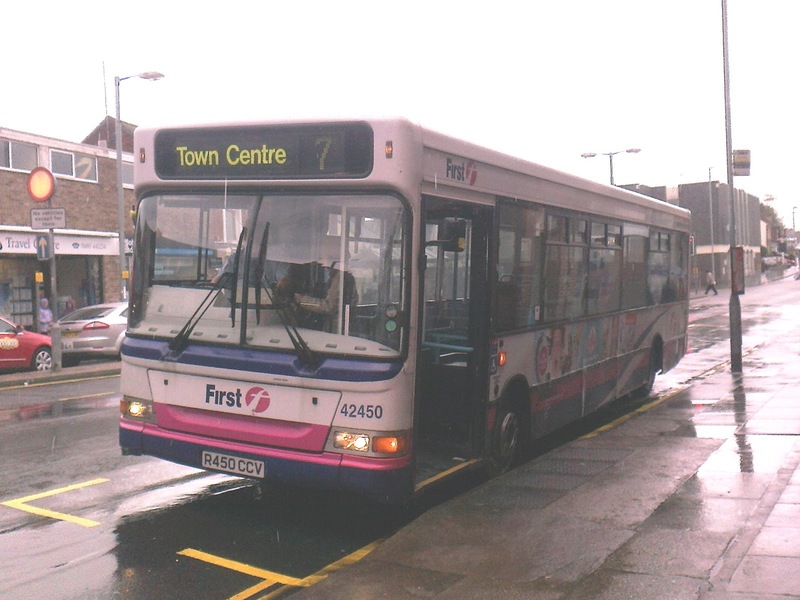 It has now been revealed in a Norfolk County Council document that First's 3/3A services would be a circular route connecting Newport Caravan Park at Hemsby with Great Yarmouth's Seashore and Vauxhall Holiday Parks via the town centre. The report continues by stating that it will be operated by two 'heritage' buses and two accessible buses providing alternate journeys. First has two former London Transport Routemasters which are expected to form the heritage fleet; RML2480 (JJD480D) and RML2623 (NML623E). 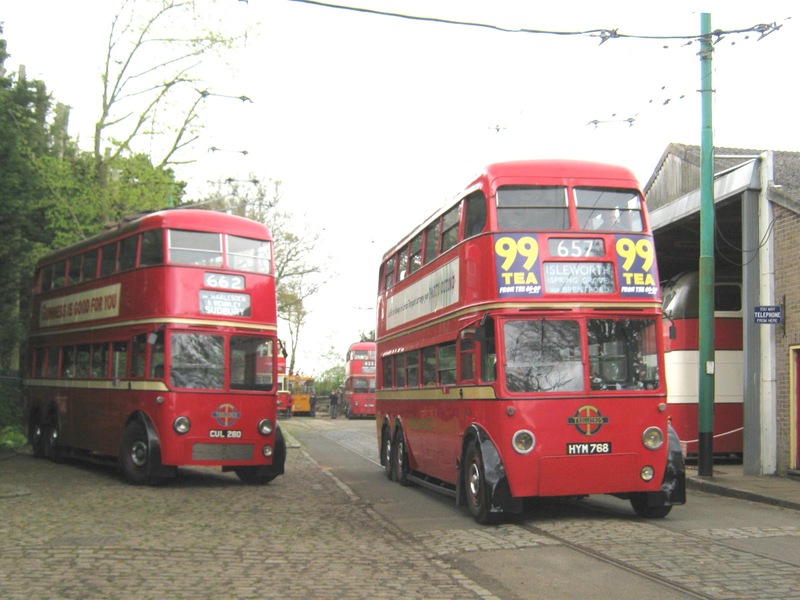 Both are in London Red livery with the latter currently at Great Yarmouth's Caister Road depot undergoing an internal repaint. Dennis Darts 43358 (V358DVG) and 43359 (V359DVG) arriving back at Lowestoft from Essex. Former Bury St Edmund Darts 43433 (P433NEX), 43435 (P435NEX) and 43440 (P440NEX) are all currently at Yarmouth either in use or stored. Meanwhile Darts 43452 (P452RPW) and 43471 (R471CAH) have returned to Norwich after a short stay at the seaside. At 3.30 pm this afternoon seven coaches were on view at Beach Coach Station. They included National Holidays Volvo B12M NH05CDH seen here alongside Whippet Coaches Volvo B10M J669LGA. The latter had arrived earlier in the day with the first Tuesday Coastal Service of the year.